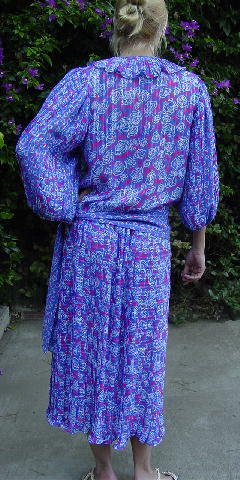 This vintage two-piece Diane Freis is 100% Georgette Polyester and was made in Hong Kong. The blouse has a 9" deep V neckline with a pleated ruffle. It has two 20" long ties with a hot pink and white bead and a blue tassel at each end. 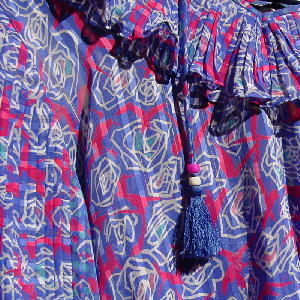 There are pleated peasant sleeves with elastic (which is pretty much stretched out) at the ends. The 4" wide bottom waistband area continues on the left side into the long ties. There is a tone-on-tone freeform pattern in aqua, medium and light blue, white, pink-azalea, and watermelon red. There are thin gold metallic thread accent lines. The pleated skirt has a 2" wide elastic waistband. 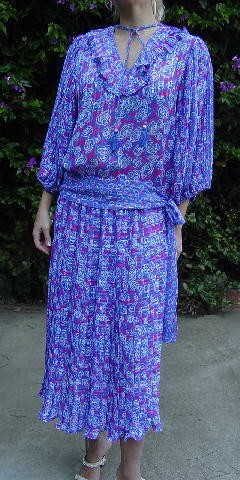 You can mix and match the blouse with other skirts, pants, or jeans, and the skirt with other blouses.